Digital ad firm Rokkan and ad agency Team Detroit launched a real-time social project as part of a larger campaign promoting Ford Motor Co.'s 2013 Ford Escape. The project influences the direction of participants on NBC's reality show "Escape Routes." The campaign attempts to redefine social TV with support from the production company Profiles. Rokkan created and launched Ford's pre-season and the regular-season Web sites, as well as the game on Twitter and Facebook platforms that will run throughout the season, beginning March 31. This is the second year the companies worked together to promote the show and Ford. 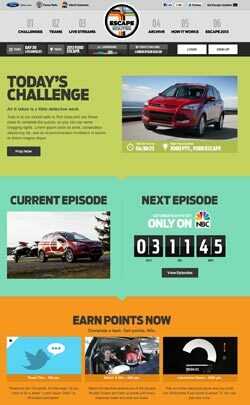 Last year, the Ford Focus project aired on Hulu rather than NBC. The show on NBC sends six teams on a nationwide collaborative competition, each in a 2013 Ford Escape. The teams work with online fans to conquer various challenges and tasks to win prizes. Registering with the Web site --available on the desktop, tablet and smartphone -- makes consumers eligible to win a prize, such as a camera, bicycle, trip or Ford Focus. Viewers will find the challenges in the games similar to those on "The Amazing Race," which Profiles also produces. People who interact with the site -- comment, play interactive games or upload user-generated content and help the teams with their challenges -- have an opportunity to earn points and badges, explains Jim Blackwelder, VP of technology for Rokkan. "Leveling up to certain badge and point thresholds gives you a likelihood of winning some of the prizes," he says. Teams on TV have different tasks. This week, the teams participated in a talent show. The videos were uploaded online, so people could vote on them. That team will earn points and the results announced on the TV show. A relay race will also include using tech to find information or gain direction from viewers through social media comments and tweets. There are several types of challenges, from interactive to flash challenges that happen randomly. The cameras are not on 24 hours per day, but when they are, the teams can communicate with viewers. "We're opening doors that allow viewers to communicate with the people on television shows through social channels in real time," Blackwelder said. "You can watch these people 24 hours per day, and also interact with them through social channels and live tweets."